Barbara is a historian who holds graduate degrees in history and multiple New York State certifications in education. Now a retired educator and principal, she is staying busy by writing historical pieces under the banner of “Passages” for The Columbia Insider, a biweekly news magazine and developing her series of children's books featuring the Little Miss HISTORY character. Marrying her love of history and teaching, Barbara hopes that her Miss HISTORY character will inspire children and adults to learn more about historical people and visit these landmarks. Barbara also finds time to read and review books twice weekly on her blogging page. 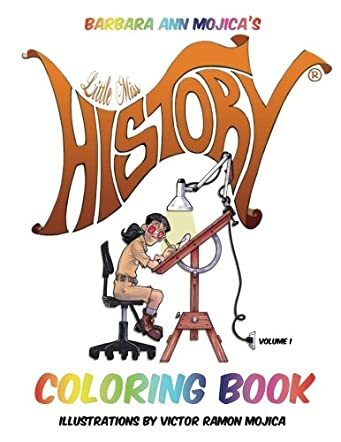 Little Miss HISTORY COLORING BOOK is the first volume in a series of coloring books, written by Barbara Ann Mojica and illustrated by Victor Ramon Mojica. Famous quotes in history, made by truly memorable historical figures, are shown throughout this book, accompanied by detailed, full-page black and white illustrations which are just ripe for the coloring! Young readers will learn about many greats from our past, including Abraham Lincoln, Napoleon Bonaparte, Geronimo, Franklin D. Roosevelt, Marilyn Monroe, George Washington and many more. At the end of the book, the reader will also find an interesting quiz which will test their observation skills. Barbara Ann Mojica’s interactive history and coloring book will actively encourage young readers to follow up and learn more about some of the people who have been so instrumental in carving out the world in which we live today. Whether the character and quote reflects positively or negatively, each one accurately portrays the characteristics of the person who’d uttered those words. In producing Little Miss HISTORY COLORING BOOK, Barbara Ann Mojica also brings out the creative side of the reader, allowing them to put their own personal touch to this particular history book. With Art and History combined, it is almost like a small classroom between the front and back covers, which will keep children busy and entertained for hours on end in quite a productive way, taking their focus away from television and video games for a little while, giving their eyes a break. I found Little Miss HISTORY COLORING BOOK to be enlightening and fun, and recommend it to children aged 7-12, who enjoy coloring while learning new things about interesting people of days gone by. If you and your kids love Barbara Ann Mojica’s series, “Little Miss HISTORY” (how would one not? ), and follow the heroine, whose passion for travel is equaled only by her inquisitive mind, then you’ll be delighted with “Little Miss HISTORY COLORING BOOK” (Volume 1). This exquisite coloring book, illustrated by Victor Mojica, the same gifted artist whose stunning work adorns the first seven books, is challenging and inspiring. This must-have book invites kids (and their imagination) to interact with Miss HISTORY at some of the famous sites she visits as well as meet many of the celebrated individuals she encounters in her travels. Well-known quotes that are attributed to the historical figures depicted accompany the images and enrich this already fabulous creation. Highly recommended! My two daughters and I enjoyed this coloring book. My girls enjoyed coloring the pictures while I talked about the people and famous quotes they said. It is a good coloring book to teach kids about history without them realizing they are learning! My girls do not usually like history, but they enjoyed coloring in this book and learning about famous people in history became interesting to them! Great job on the book!